You are accused of a crime. Who would you rather determined your fate - a human or an algorithm? An algorithm is more consistent and less prone to error of judgement. Yet a human can look you in the eye before passing sentence. Welcome to the age of the algorithm, the story of a not-too-distant future where machines rule supreme, making important decisions - in healthcare, transport, finance, security, what we watch, where we go even who we send to prison. So how much should we rely on them? What kind of future do we want? Hannah Fry takes us on a tour of the good, the bad and the downright ugly of the algorithms that surround us. 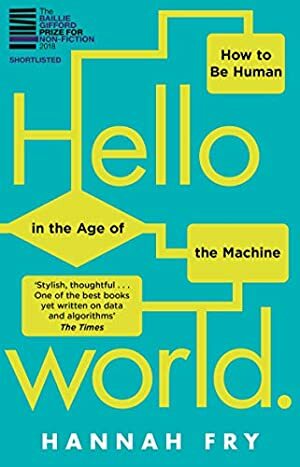 In Hello World she lifts the lid on their inner workings, demonstrates their power, exposes their limitations, and examines whether they really are an improvement on the humans they are replacing. Track It. This book has been £0.99 within the past six months. Log In to track Hannah Fry on eReaderIQ. to be notified each time the price drops on any book by Hannah Fry. to stop tracking Hannah Fry. We started tracking this book on May 25, 2018. This book was £9.99 when we started tracking it. The price of this book has changed 3 times in the past 328 days. The current price of this book is £5.99 last checked one hour ago. This lowest price this book has been offered at in the past six months is £0.99. The lowest price to date was £0.99 last reached on February 7, 2019. This book has been £0.99 one time since we started tracking it. The highest price to date was £9.99 last reached on February 8, 2019. This book has been £9.99 2 times since we started tracking it. We last verified the price of this book about one hour ago. At that time, the price was £5.99. This price is subject to change. The price displayed on the Amazon.co.uk website at the time of purchase is the price you will pay for this book. Please confirm the price before making any purchases.